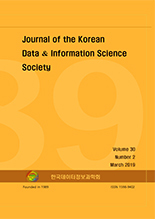 Minjung Kwak,(2019).Genome-wide discovery of monotone mutations using logistic regression analysis of evolutionary experiment with Drosophila.한국데이터정보과학회지,30(2),503-513. The genomic basis of adaptation to novel environments is a fundamental problem in evolutionary biology that has gained additional importance in the light of the recent discussion about global change. Here, we combined experimental evolution in Drosophila melanogaster with the genome-wide next-generation sequencing of DNA pools to identify alleles that are favorable in a different laboratory environment and traced their trajectories during the adaptive process. We applied logistic regression analysis that showed changes over time using the maximum likelihood method. After applying Bonferroni correction to adjust for multiple comparisons we found 12,166 significant genetic markers using a logistic regression approach whereas the commonly used Cochran-Mantel-Haenszel test identified 2254 significant genetic markers. Our results Provide a useful tool for testing the time-dependency of allele frequencies in genome-wide evolutionary experiment data.